There are certain characters in cinematic history that have become iconic heroes – people audiences enjoy revisiting time and time again on the big screen. Indiana Jones, James Bond and Dirty Harry fit that mold, and after 1988’s DIE HARD was released everyone fell in love with John McClane, a character that helped transform Bruce Willis from a MOONLIGHTING television star to a blockbuster megastar. The everyman hero who specializes in being the wrong man in the wrong place at the wrong time has already had four theatrical adventures, all generating impressive box office returns, but with none of the sequels coming close to the quality of the original outing. 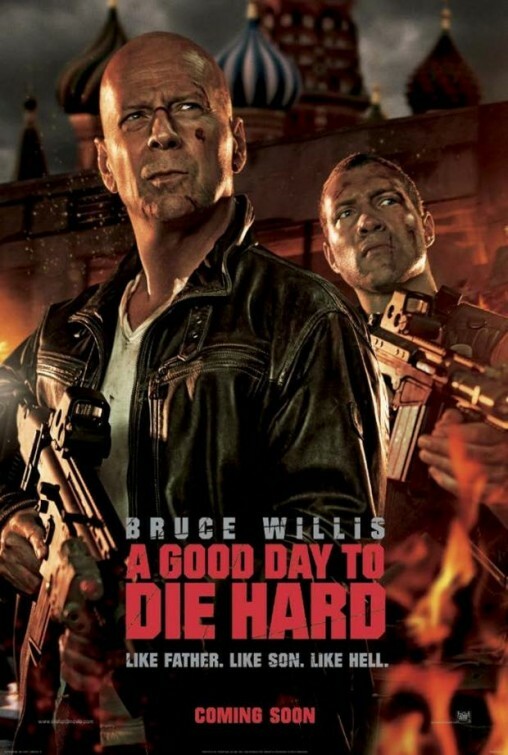 Perhaps the most controversial decision made with the franchise came with the 2007 entry of LIVE FREE OR DIE HARD, which was released theatrically as a PG-13 film… which of course means the trademark extreme violence and frequent cuss-filled wisecracks fans have grown accustomed to with John McClane got significantly watered down (FYI – there exists an UNRATED version of the fourth film on DVD, and it’s a lot more tolerable). Now Willis is back for a fifth entry, which is rated R and set in Russia, and this time pairs the Hollywood action hero with his son. A GOOD DAY TO DIE HARD opens in Russia where we see Jack McClane (Jai Courtney) getting captured after a spy plot goes bad. Back in New York City, Detective John McClane (Willis) prepares for a trip to Russia in hopes of reconciling his estranged relationship with Jack. His daughter Lucy (Mary Elizabeth Winstead) drops him at the airport begging him not to make things any worse than they already are… a bit prophetic when talking to John McClane. Once in Russia, John quickly finds Jack, only to discover his son is operating as a spy and is mixed up in a dangerous rescue of a Russian scientist Yuri Komarov (Sebastian Koch). With a ruthless assassin named Alik (Rasha Bukvic) on their tail, the McClanes must stay on the run and protect Komarov until they can figure out what sinister plot is really at play. I’ve noticed something with seasoned actors playing familiar roles, such as Harrison Ford as Indiana Jones or Bruce Willis with John McClane. It seems these days the actors are so fond of these iconic characters and enjoy revisiting them whenever possible, but are much less discerning with the scripts the characters exist in. INDIANA JONES AND THE KINGDOM OF THE CRYSTAL SKULL was far from a good Indy film, but it was fun to see Harrison playing that role again. The same issue exists with the newest McClane outing. Bruce is enjoyable playing the character we all know and love, but the screenplay (by Skip Woods, who wrote THE A-TEAM movie) feels very by the numbers and uninspired. The 97-minute running time feels short and rushed, and the pacing doesn’t echo the qualities one might expect from a DIE HARD movie. John Moore (MAX PAYNE) is the director here, and gives the film a slick look, but some of the over-the-top action sequences still feel a bit flat and obligatory. Even Marco Beltrami’s score (he also scored LIVE FREE OR DIE HARD) is less than impactful, and rarely shows hints of the themes we all know from the previous entries. To put it quite simply, this entry in the series is just forgettable. Willis seems to be moderately having fun, though his age is really showing these days, making some of those unbelievable feats that much more unbelievable. The wise-cracking McClane is only effective in select moments, and there’s certain scenes where it almost feels like Willis forgot exactly how to play the character. One of the things I liked in LIVE FREE OR DIE HARD was the inclusion of Justin Long as the comic relief sidekick. Having that kind of role to balance and play off the main hero is effective in a DIE HARD film, especially since the material is almost a self-parody at this point anyway. Instead we get Jai Courtney as the younger McClane this time, and he’s anything but funny. Courtney has the look and swagger of an action hero, but lacks the personality needed to play well against Bruce Willis. His personification of Jack McClane is rather flat and wooden, and never seems to become endearing the way it needs to. This is made more confusing since I liked his role in JACK REACHER as the main henchman to the villain. Courtney is capable of good acting, but here he just doesn’t work, which makes the prospect of this film being a passing of the torch that much more scary. Sebastian Koch is okay with his role of Komarov, and definitely wins the “most-distinguished looking” award of the piece, and Yuliya Snigir is striking and interesting to behold as Irina, though sadly is given far too little to do in the script. Rasha Bukvic also fails to captivate as the primary bad guy, though he does have a few funny lines while chomping on a carrot. A GOOD DAY TO DIE HARD isn’t an awful film, just far from a memorable one. It just sort of sits there, playing out the way you’d expect it to and never really coming to life. As a DIE HARD movie, it gives you some of the crazy action moments you’ve come to expect, but as a piece of entertainment it’s rather lacking. Fox must have known something when deciding to release this on Valentine’s Day rather than pushing it as a summer blockbuster. Rumor has it a sixth film is on the way, so perhaps the one positive we can take away from this is the idea that the filmmakers will (hopefully) learn from their mistakes. After having a blast sitting through the other 4 movies in a marathon at the theater, the new one was kind of a let down. The other movies had a sense of fun to them that this one did not. Mica – curious, did they show the R-rated or PG-13 cut of LIVE FREE OR DIE HARD during the marathon?